The news recently broke that Blizzard is forcing the United Hearthstone League to shut down. If you haven’t heard of the United Hearthstone League, don’t feel bad, most people haven’t (including me before today). It’s a tiny operation that doesn’t compete with Blizzard’s events in any meaningful way. It has a Discord with 100 members, a Youtube channel with 51 subscribers, and no prizes or sponsors as far as I can tell. It looks like it’s run by a bunch of fans who aren’t making any money off it, and are doing it just because they love Hearthstone. I’ve talked about this before, but this is the direction all esports are heading. Unlike traditional sports, with esports game companies literally own the game being played, and have the ability to legally stop anyone else from doing anything esports-related with their titles. A few years ago, when esports were getting off the ground, the companies were content to let anyone host events or leagues more or less as they wished, because this was good for development of the scene. Now, as esports becomes more established (and more money is involved) that’s starting to change pretty quickly. My photoshop skills aren’t great, but you get the point. Well, they’re doing it. And for the first time people are noticing (well by people are noticing I mean that Mike Lowe’s tweet about this has been at the top of /r/hearthstone all day with 3,500+ upvotes, and a couple of smaller sites have picked up the story). What I’m curious to see now is what happens next. Will this snowball and become a huge controversy like my buddy predicted, or will the story fade gently into the good night over a couple of days? My hope is that it’s the former, if only because, as I’ve said before, I think game companies monopolizing everything this way is ultimately bad for esports. What’s Blizzard’s incentive to improve Hearthstone as an esports product if they can literally sue any competitor out of business anyway? However, as it stands Blizzard has every legal right to do what they’re doing. The only thing that can be reasonably expected to stop them, and affect how they approach this issue in the future, is a nice, loot-box sized controversy. I don’t usually cheer for the reddit ball of hate to crush all in its’ path, but, well, fingers crossed time around. 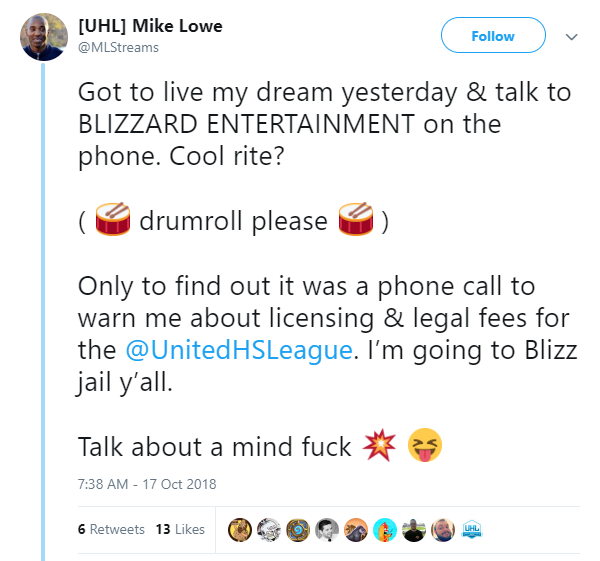 Author Marius AdomnicaPosted on October 17, 2018 October 18, 2018 Categories Uncategorized5 Comments on Blizzard Starting to Shut Down Hearthstone Fan Leagues – How Will Community React? It’s been a tough few weeks for video game hackers. Yesterday in Los Angeles, a hacker responsible for a number of DDoS attacks against World of Warcraft’s servers was sentenced to one year in jail, as well as being ordered to pay $30,000 in restitution to Blizzard for the cost of responding to the attacks. This news comes on the heels of reports last week that South Korea has sentenced two of thirteen hackers recently arrested for making cheats for Overwatch, with one receiving a $10,000 fine, and the other receiving probation. Similarly, China has recently arrested 15 individuals charged with making PUBG cheats, levying a whopping $4.5 million USD in fines against them. One notable thing about all these cases is that the perpetrators were charged criminally. While game companies have been suing hackers in civil court for years (see for instance Epic’s recent crusade against a 14-year-old Fortnite cheat maker), this is the actual government coming after people, often expending considerable resources to do so. For example, the WoW hacker above was caught after an international investigation spearheaded by the FBI, which took 8 years to conclude (the attacks actually occurred in 2010, the hacker was indicted in 2011, then the US government spent spent the intervening time, and what I assume are considerable resources, fighting to extradite him from his native Romania). Cue 8-bit version of the “Cops” theme. These kind of stories show how far the perception of video games has changed in mainstream society. I think it’s pretty safe to say that if a game company had gone to a law enforcement agency 20 years ago and asked for their help catching someone making CounterStrike hacks, they would have been politely told to mind their own business. After all, video games were still seen as kids stuff back then. The government wasn’t going to divert resources they could be spending on catching drug dealers to trying stop people from being able to see through walls on de_dust. Nowadays that’s not the case. Video games are big business, and when Blizzard calls, the FBI apparently listens. Some countries, like Korea, have even passed legislation explicitly making it illegal to make video game hacks, with violations of the law punishable by up to 5 years in jail. And crucially, all this is seen is perfectly fine by society at large, with no one really raising any eyebrows when any of this stuff happens, even outside gaming circles. While I think it’s still an open question whether this kind of behavior really deserves the kind of serious criminal sanctions we’re talking about here – after all, you could argue all these people are really doing is mildly interfering with others’ enjoyment of an entertainment product – it’s still good to see video games being taken seriously this way.